The Elation Professional OPTI 30 RGB is the next generation par can to the already popular OPTI 30. 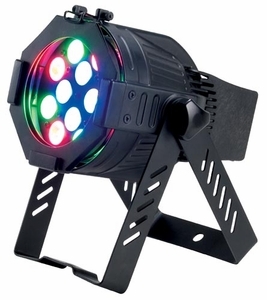 The OPTI 30 RGB is a powerful LED Par Can with twelve 1-Watt LEDS (4 Red, 4 Green, 4 Blue). There is no need to add color gels because the OPTI 30 RGB is designed with RGB color mixing and can achieve almost any color desired. Consuming very little power and producing almost no heat, the OPTI 30 RGB is great for any indoor application such as stages, night clubs, restaurants and retail environments. Available in three colors: black, silver or white. � Weight: 11 lbs. / 2.4 kgs.